Some of the Imagine Austin indicators associated with the Compact and Connected Priority Program demonstrate progress towards our goals, while others show that the unprecedented growth of our region is difficult to manage. Below you will find a detailed analysis and description of each of the Compact and Connected indicators. Download all indicator data here. Description: This indicator tracks the change in developed land area in the Imagine Austin study area, and is a way to measure sprawl. "Developed" land is any land that has been improved, either with buildings or other functions, including new parkland and open space. Austin's developed land area sprawled from 53 square miles in 1970 to over 300 square miles 2010. Most of this development has not been compact, resulting in longer commutes and development patterns that are more difficult and costly to serve with public transportation and infrastructure. Imagine Austin calls for most new development to occur in growth centers, along corridors, and as infill development, while protecting agricultural, natural, and environmentally sensitive areas. About 50 square miles of area within the City and ETJ have been developed between 2008 and 2016, bringing the total to 372.1 square miles. While a majority of new development occurred in activity centers and corridors after 2012, we continue to see sprawl development of large tracks of previously undeveloped or agricultural land. The city's developed area has continued to expand since the adoption of Imagine Austin in 2012, but the rate of expansion has slowed since 2010. In 2012, the annualized rate of expansion of developed land area was 1.59%. The most recent annualized rate of expansion of developed land area from 2016 was 1.27%. For context, Austin has developed a land area equivalent to the size of the city of San Fransisco since 2008. The slower pace of expansion is encouraging, but also points to the fact that developable land is growing scarce. Continuing a sprawl development pattern will move us further away from our community vision of a compact and connected city and would further exacerbate issues like traffic congestion, pollution, and financially unsustainable infrastructure and service costs. Over 60% of the Imagine Austin study area is now developed and much of the remaining 40% of undeveloped land is used for agricultural purposes or has environmental limitations such as floodplains, steep slopes, or riparian areas. The City of Austin creates a land use inventory every 2 years that identifies categories of land uses that can then be classified as developed or undeveloped. Parcel GIS layers from the appraisal districts are copied and appraisal information, building permits, and other source information is "attached" to the parcels. Land use data from the previous year is also attached. Parcels with new structures based on the appraisal or building permits are classified into a land use. The information is verified in many cases through aerial photos or other observations. The land use categories are totaled and summed by their acreage in GIS. Each category is then assigned either developed or undeveloped. This dataset is updated on a 2 year cycle. The following categories of land use are assigned "Developed": Single Family, Mobile Homes, Multi-family, Commercial, Office, Industrial, Mixed-use, Civic, Resource Extraction, Utilities, Parks, Transportation, Streets, and Water. "Undeveloped" includes: Large-lot Single Family, Open Space, Agriculture, and other undeveloped land. There have been variations in collection methods for the land use inventories over the years. Totals can vary due to the condition of the source data. Description: This indicator tracks the total number of passenger boardings on all Capital Metro public transit options. Imagine Austin seeks to increase public transit ridership by expanding service to activity centers and increasing the efficiency of current system. The number of unlinked transit passenger trips has fluctuated over the last five years with an overall decline for the Capital Metro Transit Service Area. Ridership peaked in the midst of the economic downturn and high gas prices in 2009 with annual passenger trips reaching 39.4 million. The most recent data show a slightly higher number of annual trips in 2015 than in 2007, but still lower than the 9 year average of 35.8 million. The trend would indicate that the number will continue to decline; however, Capital Metro's Connections 2025 Service Plan was designed to increase ridership through implementation of a high frequency network and other system improvements. Transit ridership will be monitored continually because it is still unknown what impact factors such as the rise of Transportation Network Companies (TNC) and car sharing services, the continued decrease in gas prices, the development of housing in and near activity centers, and the changing affordability of the housing market will have on our transit system. The total number of passenger boardings on all bus, rail, and mobility services provided by the Capital Metropolitan Transportation Authority. Passengers are counted each time they board a transit vehicle. The metric is tracked by the Federal Transit Administration under Table 19: Transit Operating Statistics: Service Supplied and Consumed from 2007-2014 and the 2015 Metrics table for 2015. The data are reported monthly and annually in terms of total unlinked trips and average trips by day of the week. Description: This indicator is an estimate of daily vehicle miles traveled on public roads divided by the total population. Vehicle Miles Traveled (VMT) is a composite measure based on traffic counts from more than one source. Reducing VMT is a major goal of Imagine Austin. Increased vehicle use means increased pollution, congestion, delay, and a general breakdown and overuse of our transportation infrastructure. It is a reflection of sprawl development, separation of home and work, and poorly designed infrastructure. VMT per capita has fluctuated, with an overall decrease from 2007 to 2012; however, VMT per capita has been on the rise from 2012 through 2014 as gas prices have decreased and the economy has continued to recover from the 2008-2009 Recession. Freeway Vehicle Miles Traveled and Arterial Vehicle Miles Traveled are summed and then divided by the total population of Austin. Vehicle Miles Traveled is measured based on the overall amount of travel on roadways and may include the movement of freight as well as the movement of people through the area. VMT typically tracks closely with Gross Domestic Product (GDP). In some cases, when VMT in a particular area goes down, it is because there has been a negative fluctuation in the economy, and not always because of a modal shift or a decrease in the distance between origins and destinations. The Texas Transportation Institute (TTI) changed their methodology for this indicator in 2012, all values reflect the most recent numbers from the 2015 report. Description: This indicator measures the percent of street frontage with sidewalks by dividing the actual linear miles of sidewalks by the potential linear miles of sidewalk within the city limits of Austin. Sidewalks increase access and connectivity to jobs and services, and provide a number of benefits by improving walkability, which contributes to health, reduces emissions, and can add to the quality of life in a community. This metric has improved significantly from 2013 to 2017 (up from 43.6% to 53.1%). This improvement is likely due to a combination of factors including implementation of new sidewalks through the Public Works Sidewalk Program, implementation of the Complete Streets Policy, and construction of new required sidewalks concurrent with development projects. The percent of street frontage with sidewalks is calculated by dividing the actual linear miles of sidewalks by the potential linear miles of sidewalk within the city limits. Data for this indicator have not been tracked between 2014 and 2015. Data will be collected annually going forward. Due to limited staffing resources, reliable data suitable for publication is not available for 2014 and 2015. Some of the increase in this indicator can likely be attributed to better quality control of the data. Description: This indicator measures the total linear miles of bicycle lanes within the city limits as well as the percent of arterial miles with bicycle lanes. Bicycle lanes increase access and connectivity to jobs and services and can contribute to improved health, reduced emissions, and improved quality of life in a community. The City of Austin has continued to increase linear mileage of bicycle lanes from year to year since 2012. This indicator shows that the City of Austin continues to expand its bicycle network and mileage of streets with multimodal qualities as called for in Imagine Austin. The City of Austin began tracking the percent of arterials with bike lanes indicator in 2014. The percentage of arterials with bike lanes continues to increase year to year. While the majority of streets still do not serve all modes, this indicator shows that the multimodal qualities of streets are improving consistently. Bicycle Lane Miles are calculated by adding the linear mileage of new bicycle lanes installed in the fiscal year to the cumulative linear mileage from the previous fiscal year. The Active Transportation and Street Design project database tracks the linear mileage of each project as they are implemented. Percent of Arterials with bike lanes is calculated by dividing the total linear mileage of arterials in the City of Austin by the total linear mileage of arterials in the City of Austin with a bike lane. Total linear mileage of arterials was taken from GIS data available at the time City of Austin began tracking the indicator. The Active Transportation and Street Design project database tracks the linear mileage of projects on arterials as they are implemented. Description: This indicator measures the percentage of commuting trips made using a bicycle or walking out of all means of transportation for workers age 16 and older. Imagine Austin calls for investment in compact and connected development, including bicycle and pedestrian infrastructure, and greater use of that infrastructure through alternative forms of transportation. Although there was an overall increase from 2008 to 2011, the percentage of citywide bicycle trips has decreased year to year since 2012. This decrease is potentially correlated with an increase in the number of annual vehicle trips, which has been influenced by population growth, annexations, and lower gas prices. Since 2007, citywide bicycle mode share saw its peak in 2011 at approximately 2%. The percentage of citywide walked trips has neither increased or decreased consistently year to year since 2008, though it dropped overall by .5% since 2012. Citywide walking mode share saw its peak in 2010 at approximately 3%. The "Central City" geographic study area is bounded by Koenig to the north, Oltorf to the south, Mopac to the west, and Airport/Manor Road to the east. If looking at the static central city geographic area, as opposed to the citywide boundary, which changes over time with annexations, bicycle mode share increased between 2009 and 2012 and has held steady at approximately 5.5% since. The central city mode share yields more positive results, whereas the citywide mode share results show different and more auto-dependent travel patterns. In the central city geographic area, walking mode share steadily increased between 2009 and 2014 and then experienced a slight decrease between 2014 and 2015. This could attributed to an increase in population and those living within walking distance of the work place in the central city. Percentage of bicycle/walked trips was calculated by dividing citywide total number of journeys to work by the commuting workforce (all modes) by citywide total of journeys to work by bicycle or by walking. These values are based on citywide mode share excluding work from home. American Community Survey percentages are based on sampled statistics on the citywide level with margins of error. Description: This indicator measures the number of street intersections per square mile. For this calculation, all intersections are weighted evenly, regardless of the number of connecting streets. Imagine Austin calls for new development that is more walkable and less dependent upon automobile travel. Research shows that intersection density has the most influence on walkability and vehicle miles traveled (VMT). The data do show a slow but steady increase in the citywide average (including the ETJ) from 34.3 to the current 35.5 intersections per square mile. Some of this increase is due to developments that are more walkable, such as Mueller, but many new developments are still designed for reliance on automobiles to get to work, shopping, and recreation. Many greenfield developments are still in the form of low density, car-oriented development. Intersection density is a function of neighborhood design, jurisdictional changes, and the proportion of the city that is developed. This overall number does not reflect the variation in intersection densities across the city, and in fact older portions of Austin which follow a grid of 300’ block faces and 80’ streets have around 200 intersections per square mile, among the highest intersection densities in town. To calculate intersection density, the total land area of the City of Austin full, limited, and extraterritorial jurisdiction was summed and the area of parks, preserves, and lakes were subtracted. Then the total number of intersections within the same area was found and highways, ramps, and turnarounds were subtracted. Then a GIS kernel density analysis was performed on the intersection points for each year (2016 result is displayed as a heat map above). Finally, the number of intersections for each calendar year was divided by the number of square miles in the study area minus any changes to the study area (ETJ changes) for that particular year. This indicator is computed as needed. Street segment data are updated continually. Loss of ETJ in the years 2006 through 2009 contributed to an increase in intersection density, while gains in 2012 caused a decrease in density, but if we take this change in land area out of the equation, we see a trend of slow but steady increase in intersection density. We were able to display this variation by using a process in GIS that converts intersections into a grid or “heat map.” This shows that the most intense development is concentrated where blocks are small and the number of culs de sac are few. Definition: This indicator measures the percentage of all new residential units issued permits in the Imagine Austin activity centers and corridors as compared to the rest of Austin in a given year. 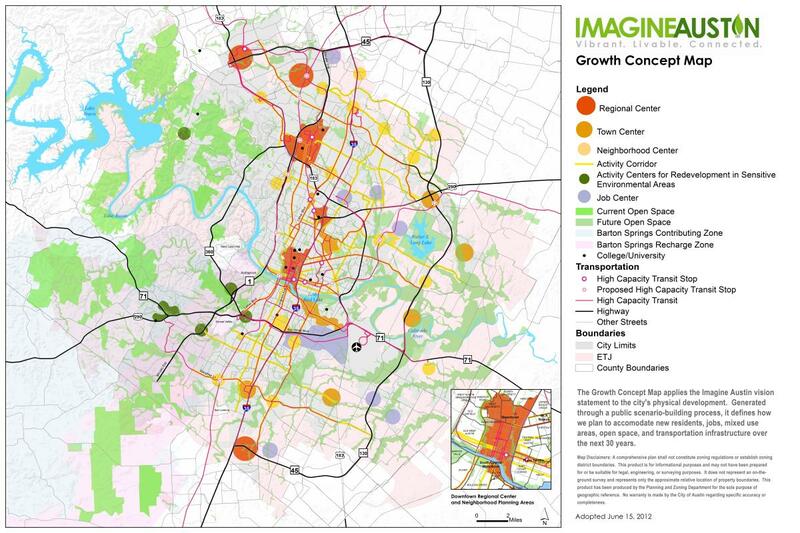 Imagine Austin calls for a majority of growth to occur in centers and corridors. Since 2012, about 68% of all new residential growth has occurred in the Imagine Austin activity centers and corridors. About a third of this growth can be attributed to multifamily units in the Downtown, North Burnet / Gateway District, and Lamar Boulevard centers and corridors. Another way to gauge residential development activity in the centers and corridors is to compare the density of new residential units built in the Imagine Austin growth areas as compared to the rest of the City. The Imagine Austin growth areas make up about 71 square miles while the City of Austin total area is about 325 square miles. The density of new residential units issued permits in the Imagine Austin centers and corridors in 2016 was 655 new units per square mile or a little more than 1 new unit per acre. In comparison, the rest of the city added 252 new units per square mile or 0.39 new units per acre in the same time period. Despite a lack of policy or incentivization of development, the Imagine Austin growth concept areas have attracted more and denser residential development than the rest of Austin. Data for issued building permits from 2007 through 2016 was retrieved from the City of Austin's Application Management and Data Automation (AMANDA). Permit data for issued building permits are available only for the full purpose and limited purpose jurisdiction of the City of Austin. The Imagine Austin corridors were given a buffer of 0.125 miles on either side and then combined with the Imagine Austin centers polygons to form one polygon so as to avoid double counting permits within both a center and a corridor. All permits issued for the construction of new residential units within the Imagine Austin growth areas were then selected and compared to the number of permits issued for the construction of new residential units outside of the Imagine Austin growth areas. Permit data are updated continually as permits are issued. It is assumed that the information reported by the developers and/or retrieved by AMANDA is accurate and complete, though no warranty is made by the City of Austin regarding specific accuracy and completeness. It is assumed for the purpose of this analysis that all the development for which the permits were issued was built out, though there is no guarantee of the same. Not all records have been populated with the correct unit numbers or square footage information. The data should be considered in a broader context of citywide development patterns, not on a specific case to case basis. This product is for informational purposes and may not have been prepared for or be suitable for legal, engineering, or surveying purposes. It does not represent an on-the-ground survey and represents only the approximate relative location of property boundaries. No warranty is made by the City of Austin regarding specific accuracy or completeness. Definition: This indicator measures the percentage of new non-residential development square footage issued permits within the Imagine Austin activity centers and corridors as compared to the rest of Austin in a given year. Since 2012, about 72% of all new non-residential development (square feet) has occurred in the Imagine Austin activity centers and corridors. The Downtown and North Burnet Gateway centers account for more than 40% of this growth. Another way to gauge non-residential development activity in the centers and corridors is to compare the density of non-residential development built in the Imagine Austin growth areas as compared to the rest of the city. The Imagine Austin growth areas are about 71 square miles in area while the City of Austin total area is 325 square miles. The density of new non-residential development issued permits in the Imagine Austin centers and corridors is 786,851 square feet per square mile or 2.75% of one acre. In comparison, the rest of the city had a density of 250,836 square feet of non-residential development per square mile or less than 1% of one acre. Despite a lack of policy or incentivization of development, the Imagine Austin growth concept areas have attracted more and denser development than the rest of Austin. Data for issued building permits from 2007 through 2016 was retrieved from the City of Austin's Application Management and Data Automation (AMANDA). Permit data for issued building permits is available only for the full purpose and limited purpose jurisdiction of the City of Austin. All permits issued for the construction of new non-residential development within the Imagine Austin growth areas were then selected and compared to the number of permits issued for the construction of new non-residential units outside of the Imagine Austin growth areas. It is assumed that the information reported by the developers and/or retrieved by AMANDA is accurate and complete, though no warranty is made by the City of Austin regarding specific accuracy and completeness. It is assumed for the purpose of this analysis that all the development for which the permits were issued was built out, though there is no guarantee of the same. Not all records have been populated with the correct unit numbers or square feet information. This data should be considered in a broader context of citywide development patterns, not on a specific case to case basis. This product is for informational purposes and may not have been prepared for or be suitable for legal, engineering, or surveying purposes. It does not represent an on-the-ground survey and represents only the approximate relative location of property boundaries. No warranty is made by the City of Austin regarding specific accuracy or completeness. Definition: This indicator measures the cumulative travel time above that needed to complete a trip at free-flow speeds. The ranking of total delay usually follows the population ranking (larger regions usually have more delay). Transportation system delay represents the overall size of the congestion problem in Austin. High system delay is related to our auto-reliance and the sprawling distances between where people live, work, and relax. From 2009 to 2014 there has been a distinct upward trend in total transportation system delay annually. This trend is reflective of the continued population growth the city and metropolitan region have seen over the same time period. For context, the annual delay per peak hours auto commuter was 52 hours in 2014, which is up six hours from the annual delay per peak hours auto commuter in 2009 (46 hours). All data came directly from the Texas Transportation Institute. For a description of their mobility calculation methodologies, visit mobility.tamu.edu/ums/methodology/. The Texas Transportation Institute (TTI) changed their calculation methodology in 2012, all values reflect the 2015 report. Mike Trimble of the Corridor Program Office is the Compact and Connected Priority Program Champion.